September 16th to September 22nd, 2018. 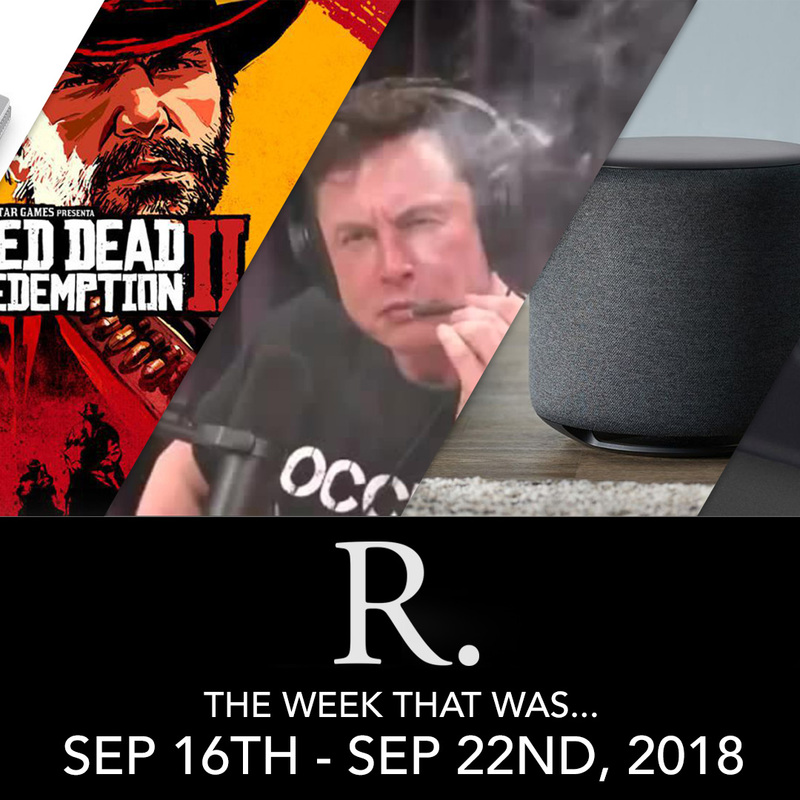 Amazon held a surprise event this week and announced more products than I could list in under five minutes so we’ll focus on the most interesting. First up they updated the Echo Dot, Show & Plus. All stay the same price, which is nice, but see cosmetic upgrades as well better speakers for the Show & Plus. The Echo Sub is an ottoman looking sub woofer that for under $200 will pair with one or two Echo Pluses to create a 1.1 or 2.1 stereo pair. In a further play for to invade the home entertainment space Amazon also announced the Echo Link & Echo Link Amp which allows you to use your existing speakers with the Alexa system, very similar to the Sonos Amp. Lastly Amazon announced a series of Alexa-enabled products like a wall clock and microwave that wont be available outside of the US and don’t implement Alexa entirely rather do things like display Alexa set timers or let you say certain commands only. GoPro, unfortunately for them, held an event on the same day. Their announcement was much smaller unveiling the new GoPro Hero 7 version of their ailing action camera. The new Hero 7 comes in a base White model, a Silver, which uses the same image processor and a Black, their flagship that can do things like live streaming and better image stabilisation. Tesla and more so Elon Musk find themselves in deeper water this week with the US Department of Justice announcing they’re conducting a criminal investigation into Musk’s now infamous tweet about the privatisation of Telsa at $420. The SEC is already investigating the tweet and its intentions after stock rose immediately because of it. Today after the announcement of the criminal investigation Tesla stock has fallen sharply. Not one to miss out on a golden opportunity Sony have announced they’ll be releasing a miniature version of the original PlaySation. Called the PlayStation Classic the mini console will include 20 PS1 games including Final Fantasy 7, Ridge Racer and Tekken 3. The PlayStation Classic is A$149.99 and available for pre-order now for delivery on December 3rd. And lastly this week, a bunch of very lucky people got to play a good 90 minutes of Red Dead Redemption 2 this week and all of them seem exceedingly impressed. Read the reports at your own peril however, whilst they’re pretty much spoiler free you may want to go in knowing nothing. Rest assured if you were a fan of the original or other Rockstar Games then it looks like you’ll be more than happy with what’s in store. Rockstar also announced that Red Dead Redemption Online, similar to GTA online, wont be available when the game launches but instead will offer a beta in late November. The online version is set in the same world as the main game but like GTA is its own, ongoing experience. On the website this week we have a review of the gorgeous Melbourne made indie game “The Gardens Between” as well as a review of one of the best, budget 4K HDR monitor available on the market the BenQ EL2870U.